Come and enjoy a memorable vacation in this fully furnished, 1 bedroom, 1 bath property on the water. The apartment has a fully equipped kitchen and dining area. The main/master bedroom has a queen sized bed, while the common area has a full futon. Bedspreads, pillows and blankets are provided but plan to bring your own sheets and towels. The elevated deck on the back of the house is perfect for watching the river as paddle boarders float by, or for watching osprey search for fish. The yard is fully accessible and provides access to the water's edge. It is also a birdwatcher's paradise! Spend the day here, at the beach or enjoying nearby attractions such as the Old Lyme Art Association, the Florence Griswold House or head over to Mystic Seaport. Our family has been in Old Lyme for generations and fully appreciate the attributes of the town and our little corner of it. The apartment and adjacent house have been in the family for many years. Both were leased as long term rentals. The apartment was the "office" for the occupants of the main house. It has been fully remodeled with a separate entrance. Riverfront, beach access, historic adjacent house. toilet, shower, Please bring your own towels. Please bring your own personal hygiene supplies. Paper supplies are provided to get you started. Plan to bring/purchase more as needed and as a courtesy, leave some for the next occupant. This property is located in a private family area. We ask our guests to respect others' privacy and discourage loud noise or improper behavior. Daikin wall unit for cooling and heating. Paper towel are provided to get you started, plan to purchase more as needed. Fully equipped for cooking and dining. 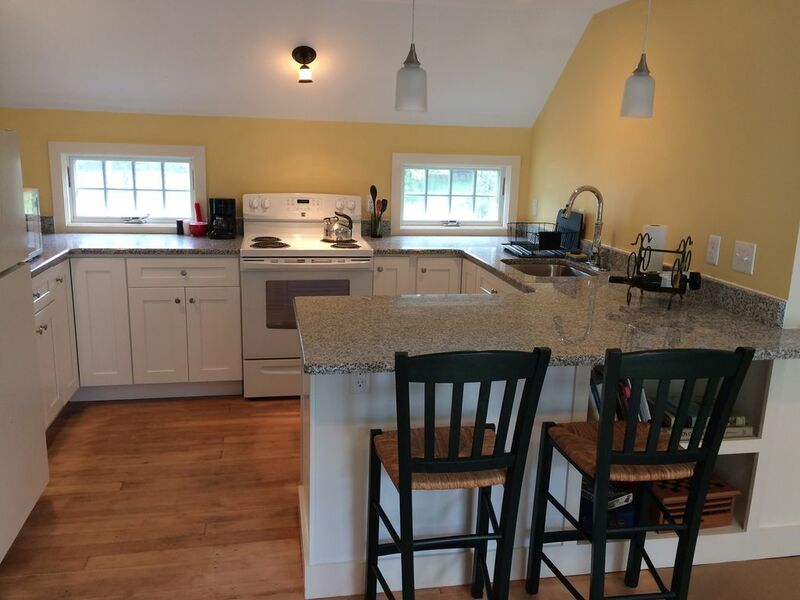 Granite countertops, plenty of work space. Some on hand, property information folder. The 224 Sq. feet deck is 4-6 feet off the ground with stairs to the back yard. Access to the apartment is via stairs. I and my pets really enjoyed our stay in the apartment. The views the water and wildlife entertained both me and my pets. I especially enjoyed having a stove , refrigerator and toaster which I hadn't had in five months. The owner of the property was a delight. I would recommend it to anyone. Thank you Claudia. We enjoyed having you stay at our apartment and greatly appreciated your well behaved pets. Stayed for a month during a renovation. Jenn and Margaret are lovely, and Jenn really cares for the property wonderfully. Beautiful and clean. Best location on the Black Hall River. Osprey and wildlife galore. Convenient to all amenities. I have recommended the apt to several friends. Thank you for a great stay during a stressful renovation!!! Thank you Wendy! We are glad that it worked well for you. And thank you for spreading the word.